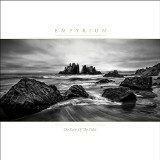 After a 12-year wait since their last full-length, Empyrium is back with an almost 100% neofolk (non-metal) album, in the form of The Turn of the Tides. I hadn't listened to Empyrium before so I didn't know what to expect, but I can advise fans of their older folk metal releases that expecting full-on metal songs on this album will lead to disappointment. The atmosphere is good, though, and the neofolk leanings are tempered by the heavier stuff towards the ends of several of the songs, keeping them at least grounded in the metal world a bit. It's not Agalloch, but it's not Nest -- more like something on a range between those two artists. Savior, the opening track, is driven by piano and soft, symphonic strings with acoustic guitar tremolo-picking in the background. It's got a big sound like a movie soundtrack, with lots of dramatic stops and starts, with gentle baritone vocals (I couldn't tell whether it was guitarist Ulf Schwadorf, or keyboardist Thomas Helm on vocals) singing flatly but in a very operatic manner, trailing off to a line sung over and over. Dead Winter Ways is better, more guitar-driven. It's also darker and more focused, which makes it a perfect vehicle for a much-needed taste of metal they give us towards the end of the track, still with symphonic elements backing it. In the Gutter of This Spring is like that too -- slow and acoustic with metal at the end -- but this one doesn't seem to be pulled off quite as well as its predecessor. There's plenty of gorgeously-produced, slow, black-metal tremolo here, however, and The Days Before the Fall, which follows the same pattern as the last two, has the best electric guitar work out of all three. I think many metal listeners will find The Turn of the Tides just too slow and contemplative for its own good, but while it'd be hard to recommend this album for any headbanging purposes, it is nonetheless a beautiful piece of work with excellent production values. I'd recommend it as a crossover for fans of the slowest and most ambient atmospheric black metal styles -- or for anyone who wants to take a break from more brutal musical styles and listen to something gentler, but still containing some steel at its core.